The black drum is a relative of the red drum (redfish) and the spotted seatrout. Although all fish in this family are able to produce croaking or drumming sounds, black drum seem to have the greatest ability to do so. In fact, it has been reported that when a large school passes, anglers can sometimes hear these sounds from their boats. These fish are thick, high-backed fish that have a variety of color from light gray to dark gray, and even some bronze tones. Juveniles have dark bars that run vertically across their sides, but these thick bars disappear with age. A distinct difference between black drum and redfish are the whiskers or barbells that black drum have under their lower jaw. What are other names for a Black Drum? 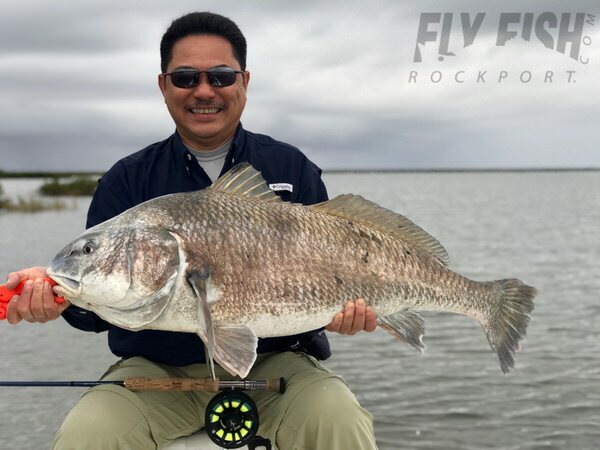 Black drum are often referred to as Texas Drum, Sea Drum, Saltwater Drum, Gray Drum, Drumfish, Striped Drum, Tambor, among others. Smaller drum are seen frequently on the flats, but the opportunity for anglers to catch bulls between 30 to 40 lbs is quite common! The Texas record taken by a sport angler is 78 lbs! These fish are incredibly adaptable and can be found in a greater variety of habitats than any other fish discussed on this page. They are found in all bay and inshore waters and offshore in Gulf waters. Closer to shore, they can frequently be found in or near brackish waters with the adults preferring the saltier areas closer to the ocean. Black Drum have similar eating habits as redfish and often dig or root out food in a head-down, tail up position, called “tailing”. These fish are not known to have good eyesight, rather they use their barbells and sense of smell to find their food. Their diet is made up of a variety of food sources, including small crabs, worms, baitfish, mollusks, and algae. 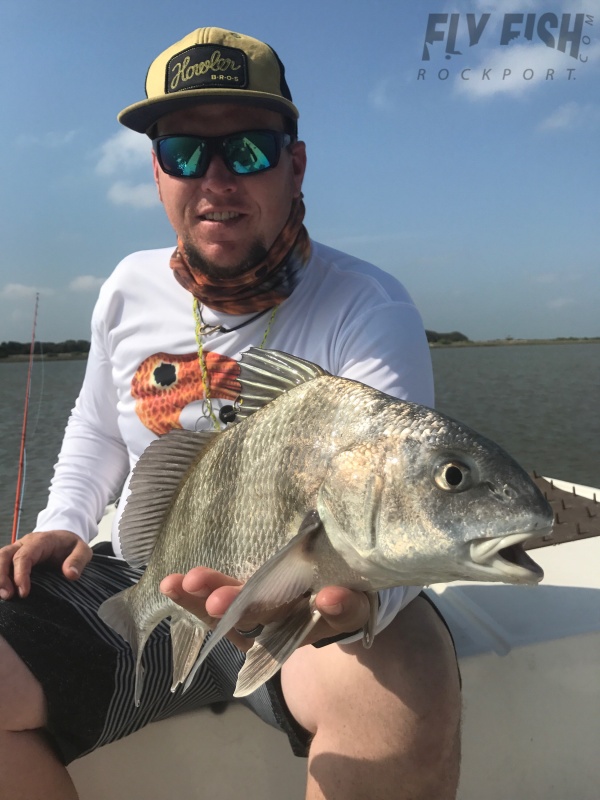 Are Black Drum targeted by anglers? 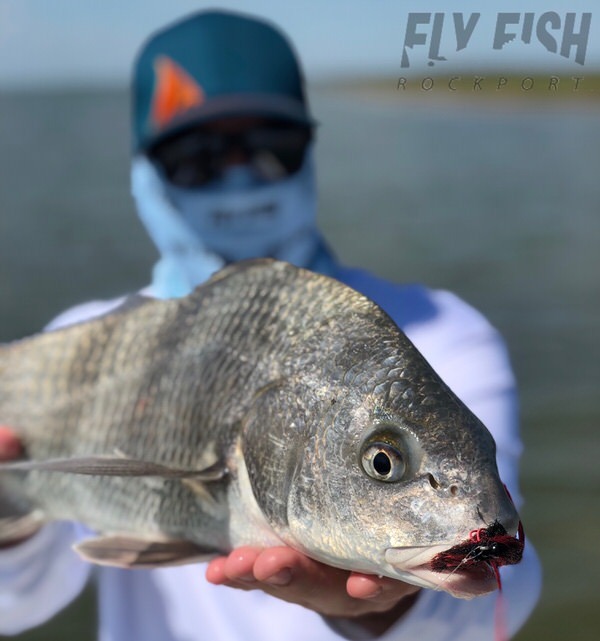 Black Drum have never fully been accepted as a game fish by sport anglers, but most will not shy away from an opportunity to cast at one if they are spotted while on the flats. Their poor eyesight makes is difficult to get them to take a fly unless it is placed exactly in the right place, but their large size make them a formidable opponent once hooked.